Remember the Space Race? Over the better part of a decade, the world’s two superpowers competed in the coldest of wars far above the atmosphere… and beyond! 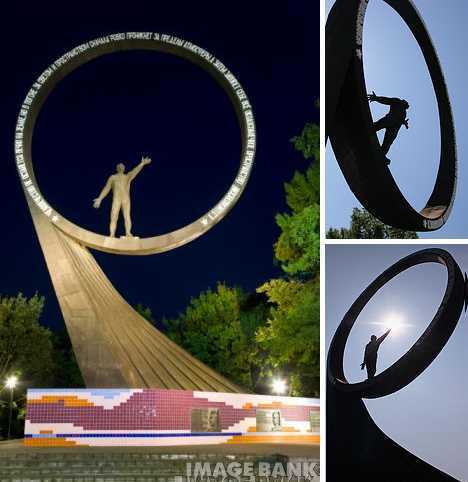 These 10 Space Race monuments document the milestones achieved by the USA and the USSR that eventually led to one small step for a man; one giant leap for mankind. On April 12th, 1961, Soviet cosmonaut Yuri Gagarin became the first human to orbit the Earth. Gagarin, who died in a 1968 plane crash, is commemorated by a number of monuments, sculptures, busts and obelisks highlighted by the Monument to Yuri Gagarin located in Yuri Gagarin Square, Moscow. 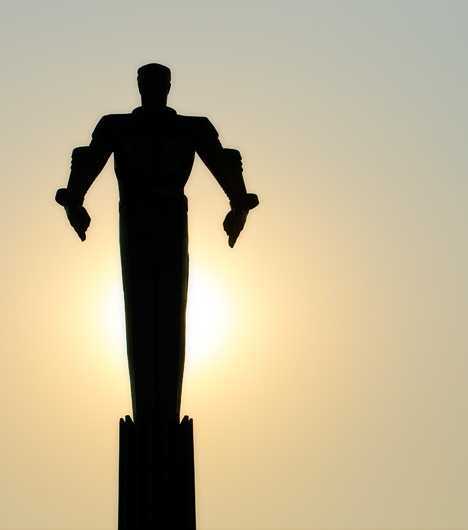 The 131-ft (40 m) tall titanium monument to Yuri Gagarin was erected in July of 1980, and features an inspirational design created by sculptor Pavel Bondarenko. 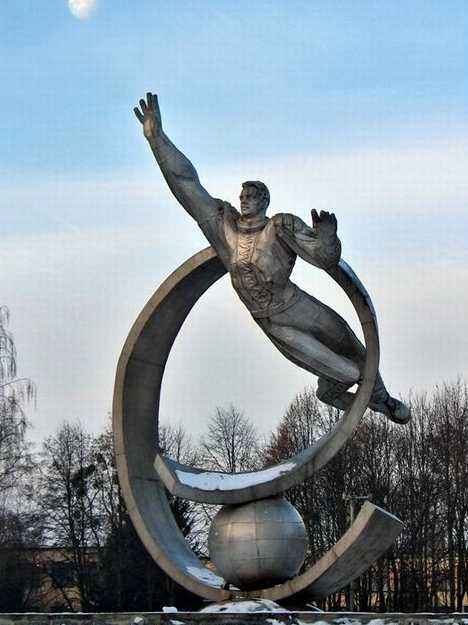 The monument depicts Gagarin in his space suit, arms partially raised as if he were about to leap into the sky. 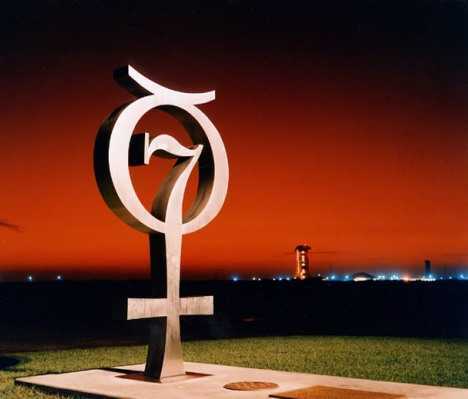 The Project Mercury Monument is located at Launch Complex 14 (LC-14) at the Kennedy Space Center. On February 20th, 1962, astronaut John Glenn’s Friendship 7 spacecraft rode the flames of an Atlas rocket booster to become the first American to orbit the Earth. 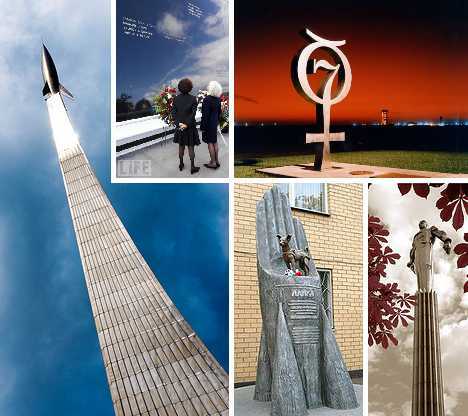 The monument combines the number 7, representing the seven original astronauts, with the astronomical symbol of the planet Mercury. Dedicated on November 10th, 1964, the Mercury Monument commemorates the six Project Mercury missions that lofted American astronauts into space between May 1961 and May 1963. 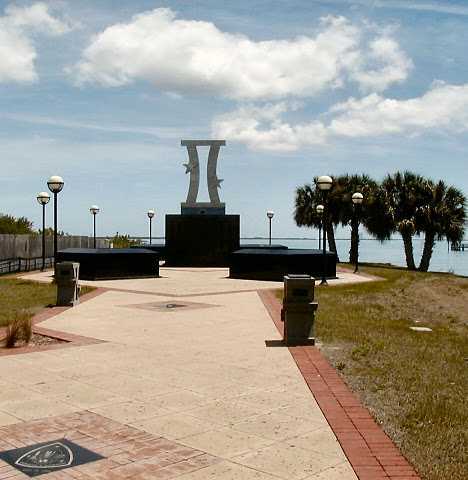 A similar monument to Project Mercury is located in Space View Park, Titusville, Florida, as part of a much larger complex of monuments celebrating the American space program. The Monument to the Conquerors of Space in Moscow, Russia, may be the most awe-inspiring of all Space Age sculptures. Its design (by A.P. 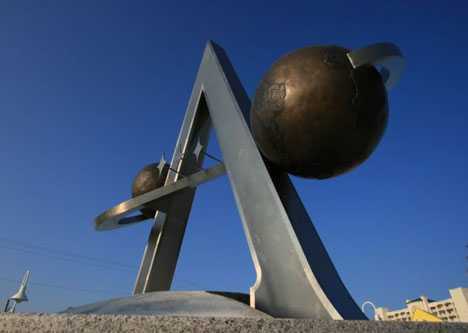 Faidysh-Krandievsky in 1964) succeeds in capturing the concept of “escaping the surly bonds of Earth” while remaining, by necessity, attached to the world’s surface. 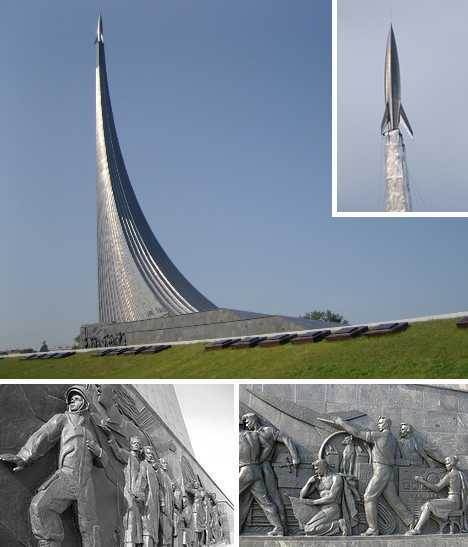 A sculpted frieze along the monument’s base pays tribute to the pioneers of Soviet space exploration and the Memorial Museum of Cosmonautics inside the base (opened in 1981) welcomes approximately 300,000 visitors each year. The monument stands 350 feet (107 meters) tall, twice the height of the Statue of Liberty, and is covered with titanium plates that are impervious to tarnish or corrosion. 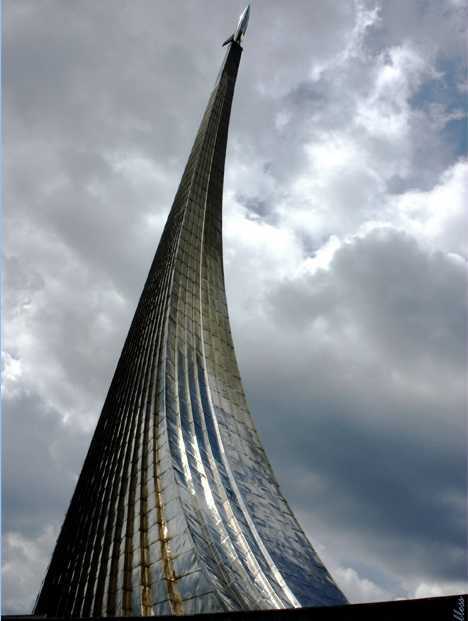 It’s magnificent sweep from ground level to the stylized rocket at its apex crystallizes the impression of a rocket launch and its accompanying plume of smoke and fire. The oft-overlooked Project Gemini encompassed a total of 10 manned missions beginning in March of 1965 and ending with Gemini 12 in November of 1966. The program successfully proved a wide range of space technologies that would prove to be essential for the upcoming series of Apollo moon missions. 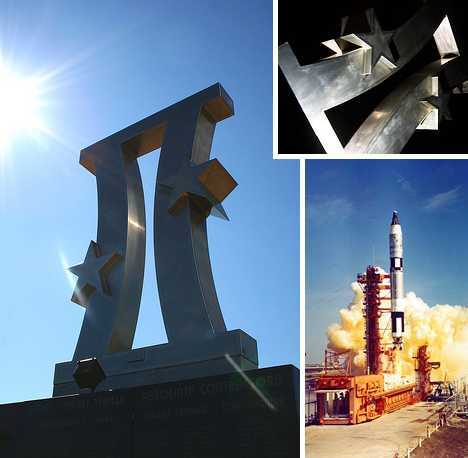 The monument bears the names of 515 space workers whose efforts were essential to the overwhelming success of Project Gemini. 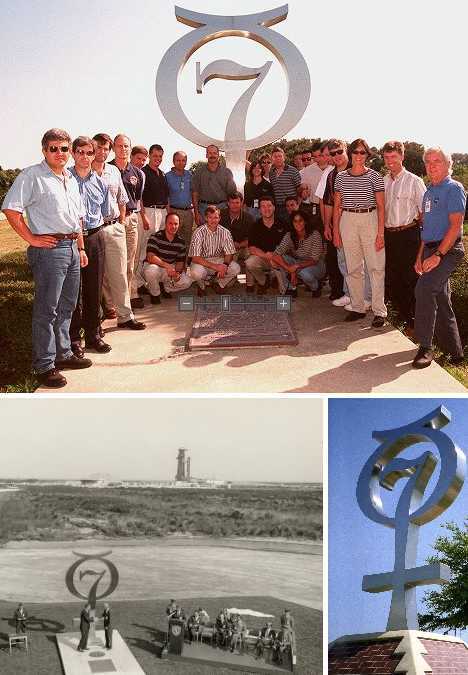 The Gemini Monument at Space View Park in Titusville, Florida, consists of a stainless steel Project Gemini logo mounted on a base of polished black granite. The total height of the monument is approximately 22 feet (6.7 meters). Zhitomir has a special claim to fame when it comes to space exploration: it’s the birthplace of Sergei Korolëv, who was plucked from Siberian exile to design the USSR’s first space satellites, space capsules and heavy lift rockets. 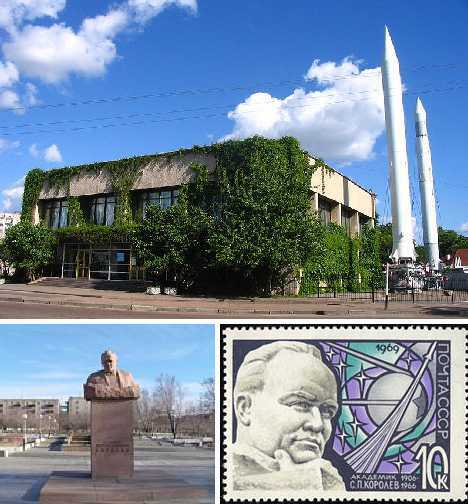 The Korolëv Museum is also located in Zhitomir, not far from the Space Exploration Monument, and features several early Soviet rockets mounted on the grounds. The Apollo Monument at the US Space Walk of Fame and Museum in Space View Park was dedicated in July of 1994. 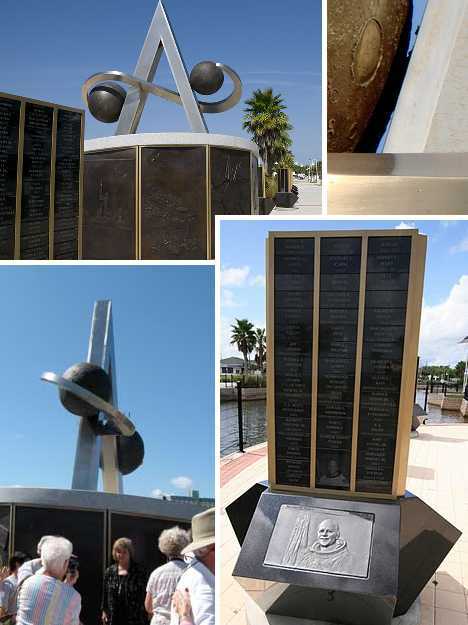 The sculptures and structures in the park are the result of a partnership between the non-profit US Space Walk of Fame Foundation (USSWOFF) and the City of Titusville, Florida. The Soviet Union launched Sputnik 2, carrying Laika, the first dog to orbit the Earth, on November 3rd, 1957. The western media dubbed the satellite “Muttnik” but the launch only added to the Soviet space program’s prestige. As for Laika, she didn’t survive the mission though there were never any plans to recover the capsule safely. Though Laika died approximately 5 to 7 hours after launch from stress and overheating, she did succeed in demonstrating that lifeforms could withstand the effects of a rocket launch into orbit. 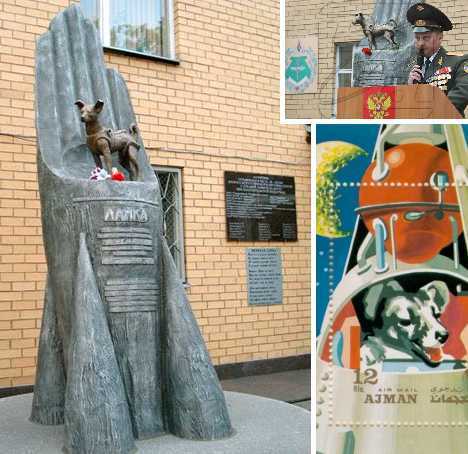 In April of 2008, a monument to Laika was unveiled in Moscow just outside the research institute that originally planned the mission. The monument shows a bronzed sculpture of Laika standing on a combination rocket and human hand. 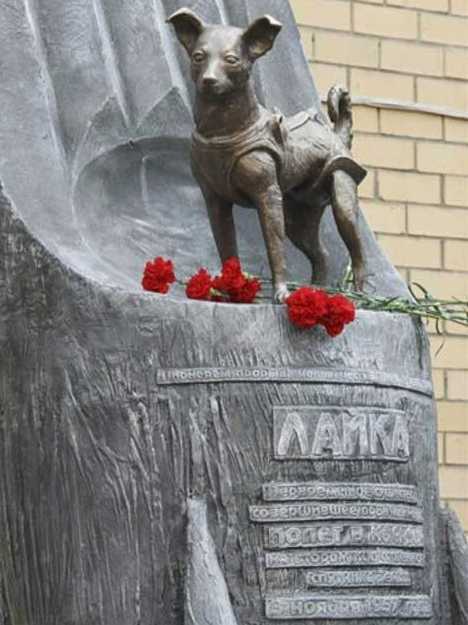 Passersby often leave fresh flowers or dog toys at Laika’s feet, showing the affection Russian citizens still feel for their four-legged space pioneer. The Space Mirror Memorial differs from other, more statuesque monuments in that no human or mechanical representation is included. Instead, the names of 24 American astronauts who died while members of the astronaut program have their names cut into the mirror allowing light from behind to illuminate them. 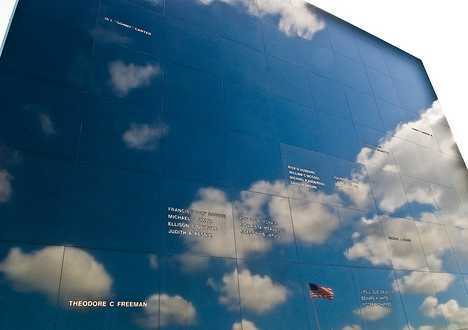 The mirror’s construction makes it seem as if the names of the fallen astronauts are floating in the sky. 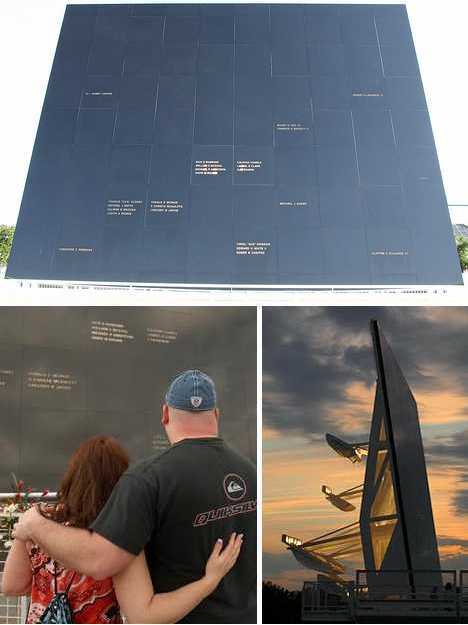 The astronauts commemorated on the Space Mirror Memorial are grouped together in cases such as the Apollo 1 or Challenger disasters in which the astronauts perished on the same mission and/or occasion. The names range chronologically from that of Theodore C. Freeman, who died in a T-38 jet crash on October 31st, 1964, to the Space Shuttle Columbia’s crew whose vehicle broke up upon re-entry on February, 1st, 2003. 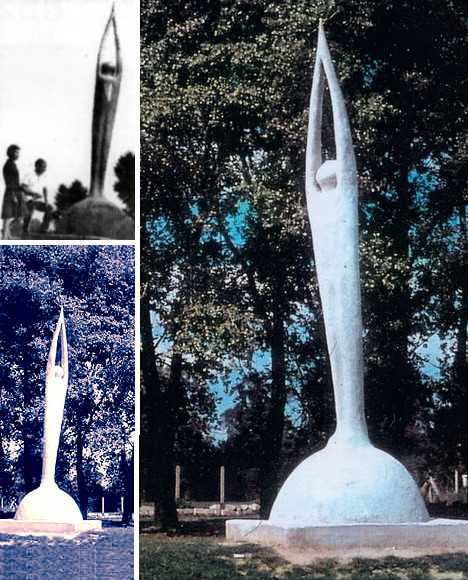 The Cosmonaut Monument in Kaliningrad (formerly the German East Prussian city of Konigsberg) was built to honor cosmonauts Alexey Leonov (who performed the first space walk), Yuri Romanenko (who was in space a total of 430 days) and Aleksandr Viktorenko (whose space missions totaled 489 days). 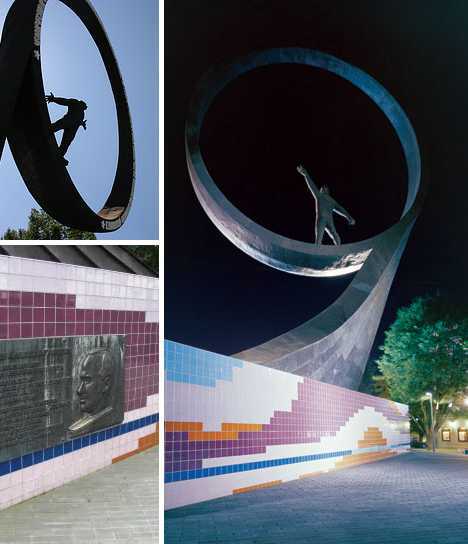 This rather large monument displays hallmarks of heavy-handed Soviet style but the colorful tiled base and embossed bronze plaques depicting the cosmonauts help give the monument a warm, human touch. Our final space exploration monument ties together the USA and the USSR in an unexpected way – via a short-lived and illegal monument that appeared on the grounds of a local stadium in Krakow, Poland. 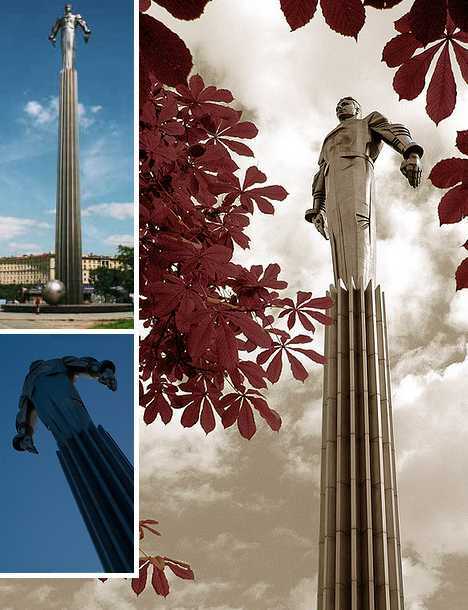 The 19.5 foot (6 meter) tall statue, depicting a stylized figure reaching for the sky, was constructed in secret by residents of Krakow and its unveiling surprised and infuriated communist authorities all the way to Moscow. Poles were aware of the American moon landing because Poland was the only Communist bloc country to directly broadcast the event on television. Word of the Krakow monument escaped party censorship and President Nixon sent a congratulatory telegram to Polish communist party secretary Gomulka, which did not help matters locally. 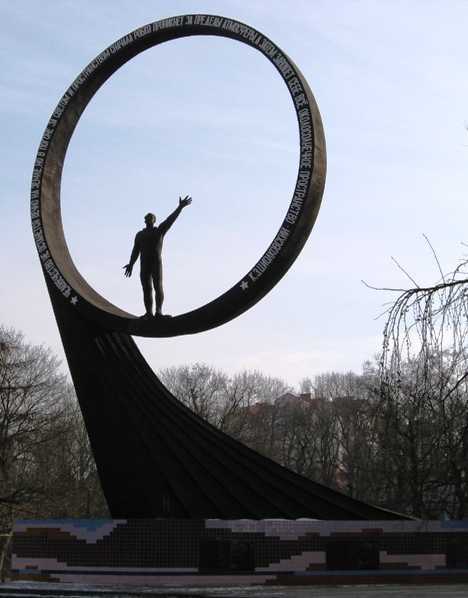 To our knowledge, the Krakow moon landing monument has not been rebuilt, which is a pity considering the vast changes in US-Polish relations since the fall of communism. 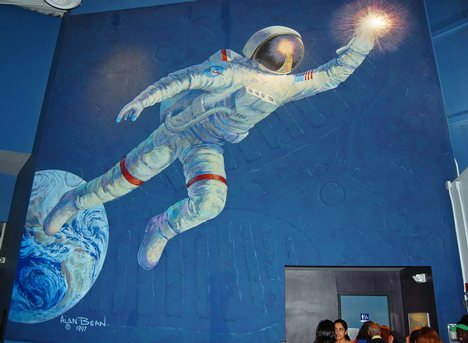 Such a gesture would serve well to commemorate giant steps for mankind… on the moon and here on Earth.